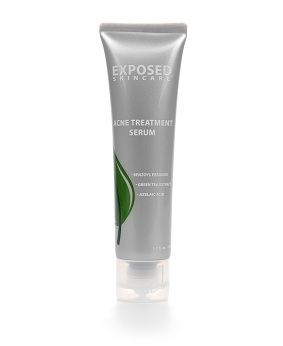 The Exposed Acne Treatment Serum is a part of a deep cleaning acne treatment program. This program includes a basic kit (facial cleanser, clearing tonic, acne treatment serum, clear pore serum and derm-x cloth), an expanded kit (the products included in the basic kit in addition to a moisture complex), and the ultimate kit (the products included in the expanded kit in addition to a clarifying mask, probiotic supplement and microderm scrub). Exposed Acne claims that the combination of products also treats acne from the inside out, but they do offer the option to purchase products separately as well. 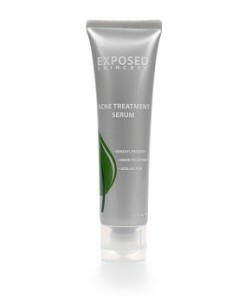 Exposed Acne Treatment Serum includes key ingredients to combat breakouts in addition to preventing future breakouts. Inactive Ingredients: Purified water, alkyl benzoate, capylic/capric triglycerides, propylene glycol, benzyl alcohol, alcohol, benzalkoniun chloride, azelaic acid, camelia sinensis leaf (green tea extract), gotu kola extract, aloe barbadensis leaf extract, tea tree oil, xanthan gum, imidazolidinyl urea, methyl paraben, propylparaben, isopropyl palmitate, silatex d-30. The list of prescription strength ingredients and the claim to treat acne with this one product are definitely intriguing. While taking a closer look at the acne treatment serum, however, one must consider that this serum alone will only treat one aspect of the cause of acne. While using this serum will certainly help, it does not treat the internal causes of acne. Because of this, it would be more beneficial to the customer to purchase other products such as the probiotic supplement. While this would be more costly, it offers longer results and the individual would then receive a full internal and external treatment for their acne. If one does not wish to purchase additional products, they can still see positive results with just the serum. While there are possible side effects, such as irritation, the one year money back guarantee ensures that no one is spending money on a product that they don’t like!